Space shuttle Atlantis soars to orbit from Launch Pad 39A at NASA's Kennedy Space Center in Florida on the STS-132 mission to the International Space Station at 2:20 p.m. EDT on May 14, 2010. 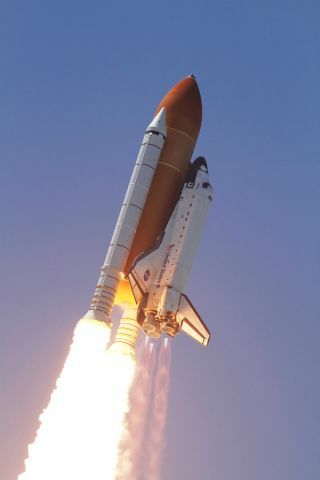 The third of five shuttle missions planned for 2010, this was the last planned launch for Atlantis. You may not be able to squeeze your whole body ontoNASA's last two space shuttle missions in history, but your face can go ? at nocharge. All it takes is a digital photo and a few clicks of the mouse. NASA is collecting digital photos and names from the publicto launch on the two finalspace shuttle missions scheduled before the famed reusablespace planes retire for good. The photographs and names can be uploaded to anew website under the "Face in Space" program. "The Space Shuttle Program belongs to the public,and we are excited when we can provide an opportunity for people to share the adventureof our missions," NASA's space shuttle program chief John Shannon said ina statement. "This website will allow you to be a part of history andparticipate as we complete our final missions." NASA's next shuttle mission is slated to launch on Sept.16 aboard Discovery, the oldest space shuttle in the three-orbiter fleet. Thatmission will deliver a robot assistant (called Robonaut2)to the International Space Station along with a cargo pod refitted to serve asa permanent closet for the orbiting lab. The U.S. space agency's final shuttle flight will beonboard Endeavour, the fleet's youngest spaceship. That mission is set tolaunch no earlier than Nov. 27 to deliver a $1.5 billion astrophysicsinstrument to hunt for antimatter galaxies and other phenomena in universe. So far, NASA has launched 132 space shuttle missionssince the fleet first began flying in April 1981. The most recent mission, theSTS-132 mission last month, marked the 32nd and final mission for the spaceshuttle Atlantis. NASA is retiring its space shuttle program after nearly30 years to make way for a more ambitious plan of sending astronauts to visitan asteroid by 2025 and then move on to Mars. The space agency plans to rely on commercialspaceships and rockets to launch American astronauts and cargomissions to the space station once the shuttle fleet retires. U.S. PresidentBarack Obama has called for the cancellation of NASA's initially plannedpost-shuttle program Constellation, which aimed to send astronauts back to themoon.